Louisville, KY — Caught on surveillance video pushing a 13-year-old student and punching him in the face, a fired school resource officer will have his charges dropped if he completes anger management classes instead. Five days after the incident, the cop was captured again on video choking another student unconscious, causing a brain injury. On January 22, Louisville Metro police officer Jonathan Hardin was caught on surveillance video speaking with a 13-year-old student in the Olmsted Academy North lunchroom. 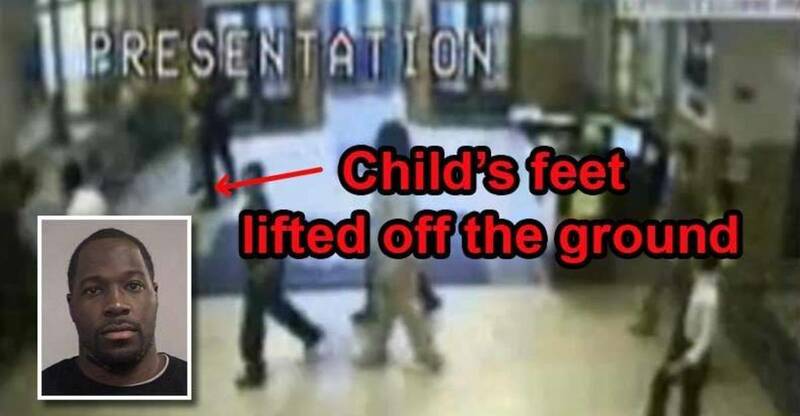 While accusing the student of cutting in line, Hardin pushed the teen before immediately punching him in the face. After knocking the student to the ground, Hardin charged the teen with menacing and resisting arrest but lacked probable cause according to an arrest warrant. Although Hardin clearly used excessive force, he remained on the job when a security camera captured him choking a student unconscious in a separate incident five days later. On January 27, several students were goofing around in the hallway when a 13-year-old appeared to chest-bump Hardin. After falling down, Hardin regained his balance and placed the teen in a chokehold with his feet lifted off the ground for several seconds. As the student’s body went limp, Hardin eventually released his grip and dropped the teen, allowing his head to hit the floor. Although the student remained motionless for over twenty seconds, Hardin did not bother to call an ambulance. After placing the student in handcuffs, Hardin eventually drove the child home but neglected to accurately report what happened to the kid’s parents. A doctor later confirmed the teen suffered a brain injury due to a loss of blood flow to his brain. In February, Hardin was charged with fourth-degree assault, first-degree official misconduct, and false swearing for punching the student in the face and attempting to cover up the abuse. He also faces wanton endangerment, official misconduct, and assault charges for choking the other student at the same school. With his next court date scheduled for December 16, the case against Hardin could be dismissed if he finishes his anger management classes. Unlike the students formerly under his protection, Hardin probably won’t be physically assaulted by an overzealous hall monitor with a badge while attending his classes. He still faces criminal charges for choking the other student unconscious five days after the punching incident.